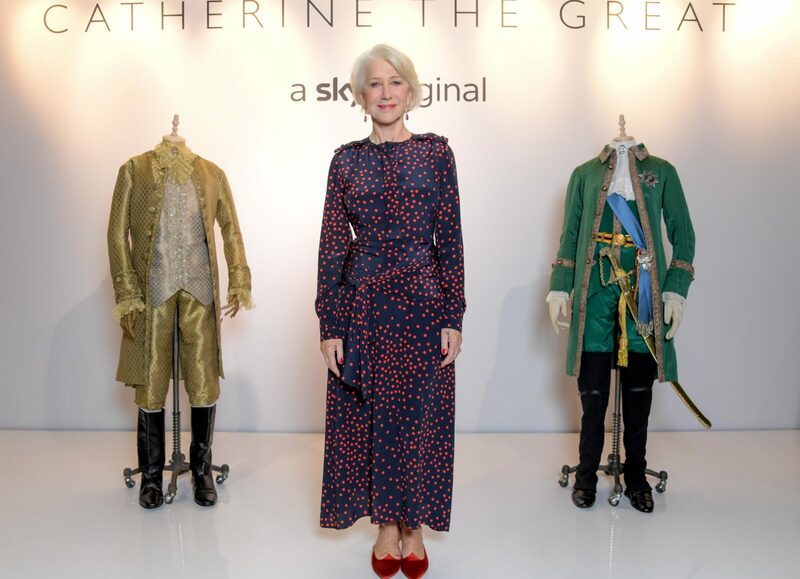 Helen Mirren showed off her elegant and stylish fashion sense in a gorgeous polka-dot frock this week as she stepped out to promote her latest drama series Catherine the Great. The 73-year-old looked stunning at the BFI and Radio Times Television Festival in a navy and red dress which tucked in at her waist to highlight her figure. Mirren opted for pointed red flats for the occasion, along with silver and red dangly earrings which complimented the outfit beautifully. The talented actress attended the event, dubbed the United Kingdom’s biggest TV festival, at BFI Southbank in London on Sunday where she revealed some of the stunning costumes worn by her character in the upcoming Sky Original drama. The Calendar Girls star posed confidently in front of cameras alongside several of the show’s elaborate costumes, a gold suit and a green military riding suit. Following on from her role as Queen Elizabeth in hit film The Queen, Mirren plays the royal role of 18th century Russian empress Catherine the Great. The four-part historical drama will follow the story of Catherine’s reign and impact on Russian politics, including the assassination of her husband Emperor Peter III and her affair with Russian military leader Grigory Potemkin. Speaking at the festival about her role in the much anticipated drama, Mirren explained what led her to play the led character. “I made the mistake when I was doing an interview and someone said, ‘what would you like to do next?’ Maybe it was after Elizabeth,” The Daily Mail reports she said. “I said, ‘well, I’d quite like to play Catherine the Great, actually. That would be an interesting character. People heard that, producers David Thompson, who was involved in Elizabeth, and Charlie Pattinson – and they went off and raised the money. 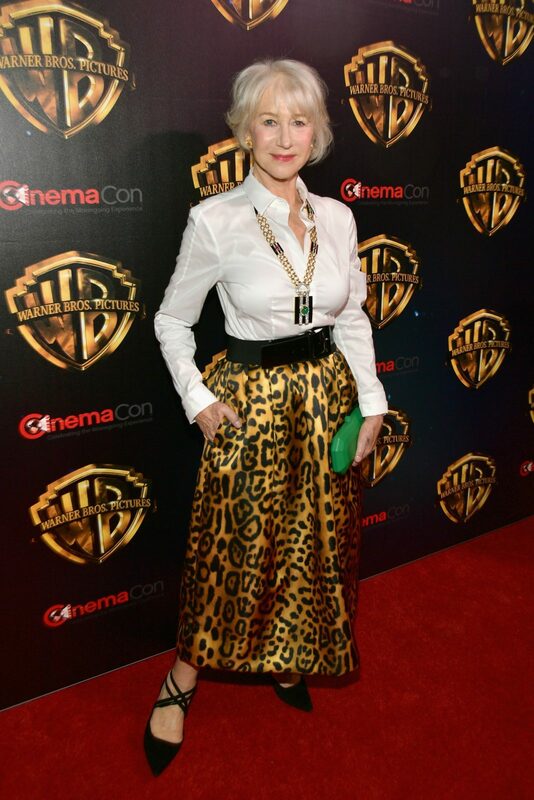 Mirren was last seen out and about at the CinemaCon event in Las Vegas earlier this month. The English actress exuded glamour in a full-length satin leopard print skirt, complete with a chic crisp white shirt and chunky black belt that she wore around her waist. The star accessorised with a gold statement necklace, and added a pop of colour to her ensemble with a bright green clutch. As she has done for some time, Mirren proudly showed off her silver locks in a classy hairstyle. Are you a fan of Helen Mirren? Would you be interested in watching her in Catherine the Great?